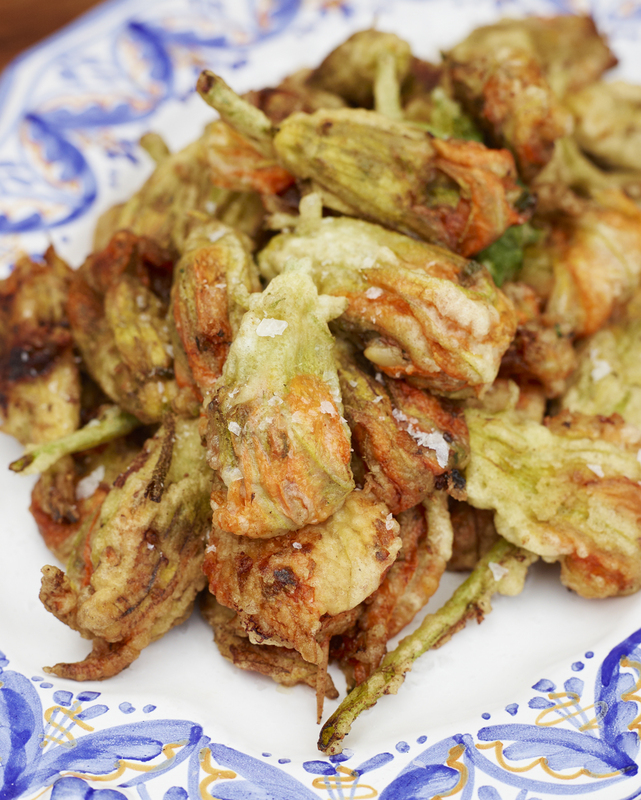 The delicacy of fried zucchini flowers: those who have eaten them before love them, and those who have yet to try them can’t wait to fall in love with them. 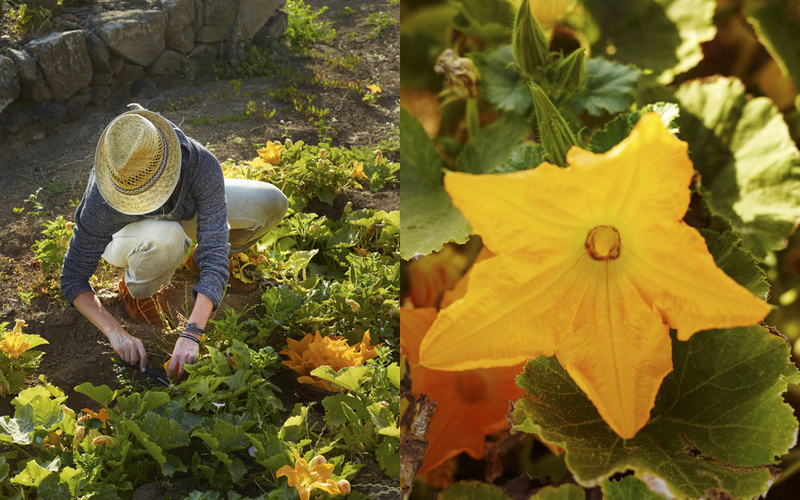 At the moment our zucchini plants are blooming, so now is the time to really enjoy them. Harvesting the flowers must be done in the early morning when they are freshly open. As the sun grows stronger they close. By mid morning they have twisted themselves closed, making it difficult to fill them. If you are not an early riser, of course you can just brush them off, dip them into batter and fry and eat with a good salt like artisanal unrefined salt from Sale Natura http://www.salemarinoartigianale.it/index.html, then it doesn’t matter if they’re closed. If you are like me, you will love filling them with some goodies like cheese, almonds, anchovies and oregano. Remember stuffing the flower is MUCH easier to complete when they are harvested while open. A baking sheet covered with paper towels or news paper for the flowers to drain upon after frying. 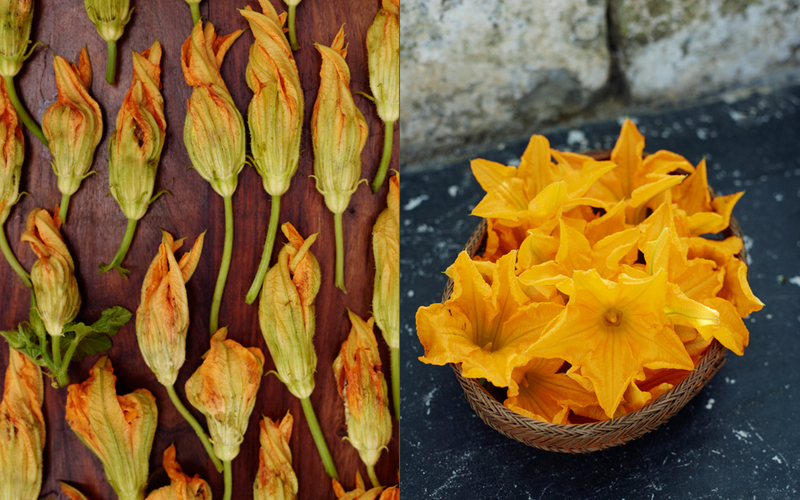 Tongs or a slotted spoon to turn the flowers over while frying and to remove them from the oil. You can stuff the flowers with anything just make sure it doesn’t have a lot of liquid or oil in the content for the flower petal is very sensitive. 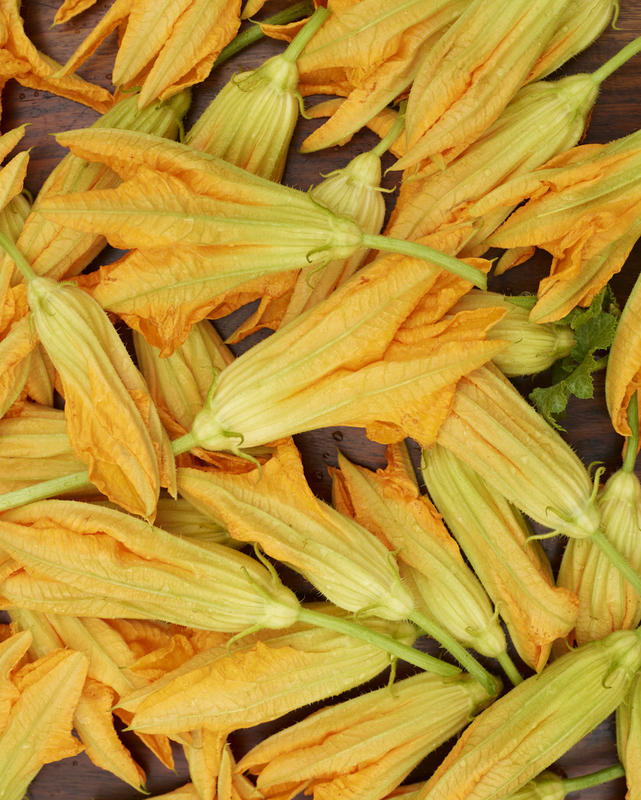 Stuffed zucchini flowers is a great way to take leftovers and dress them up! Please omit the nuts from the filling below if you have nut allergies or if you are preparing the flowers to bring or serve at a gathering or party where you do not know if people are allergic to nuts. Using the pastry or clean paint brush clean the exterior of the flowers. Optional: next you can gently take out the pistil using a tweezer or carefully use your hand. 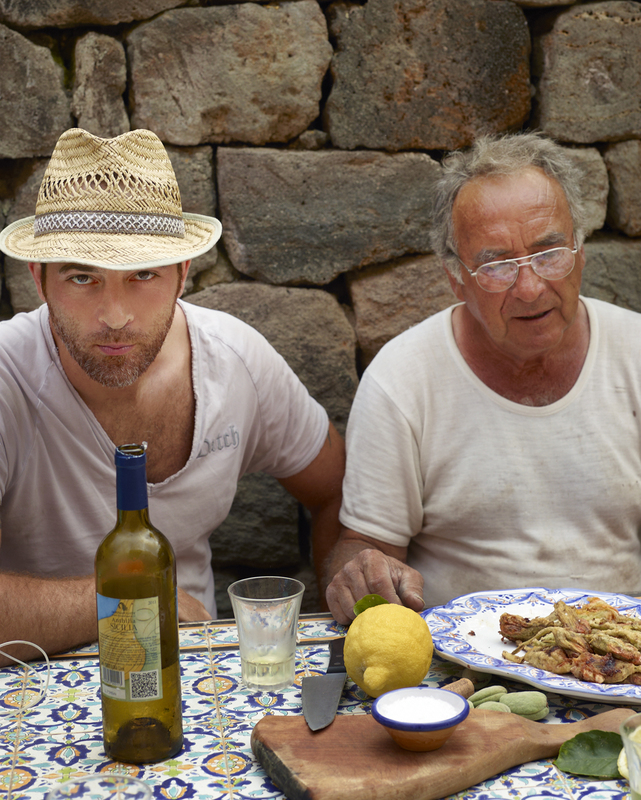 Separately cut the anchovies fillets each in 4 equally sized pieces. Holding the flower gently, fill the inside using a small spoon or your fingers, work gently and careful for avoid the flowers you want the flower to remain intact. Only fill the flower 3/4 full. With your finger make a little hole where you place the piece of anchovy. Fold and close the petals gently. Finish with a twist of the petals to make a tight seal. Place aside on a tray. Repeat the process until all the flowers are filled and ready to fry. Mix flour, bicarbonate and whisk together with the sodawater and olive oil until smooth (should have the consistence similar to a pancake batter). Let the batter rest while heating the oil. Pour your frying oil to heat. Brush the flowers one by one with the batter attempts to reinforce the closure of leaf and on top with a little batter. Fry the flower until golden, let drain shortly on paper towels. Serve with salt flakes to sprinkle and some fresh lemon. 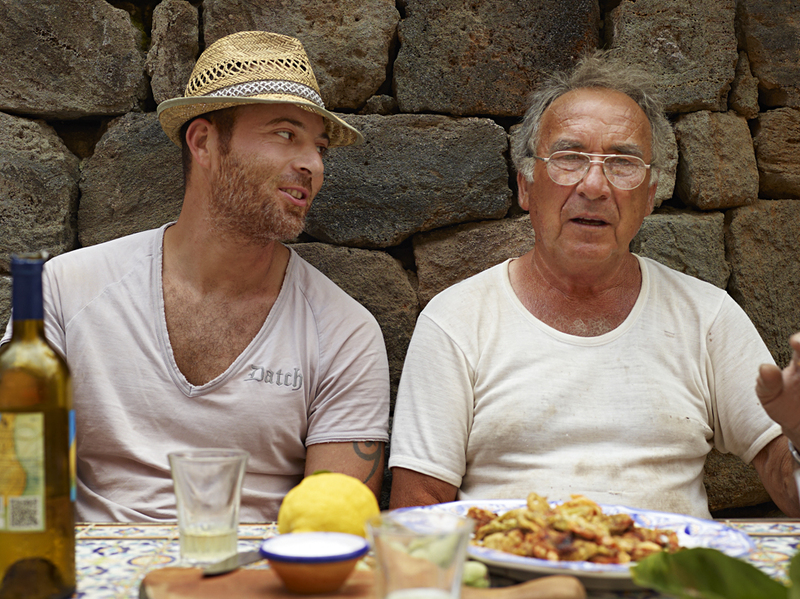 Carlo and Pino, having a break after working all day with making a new barbecue construction in the garden. 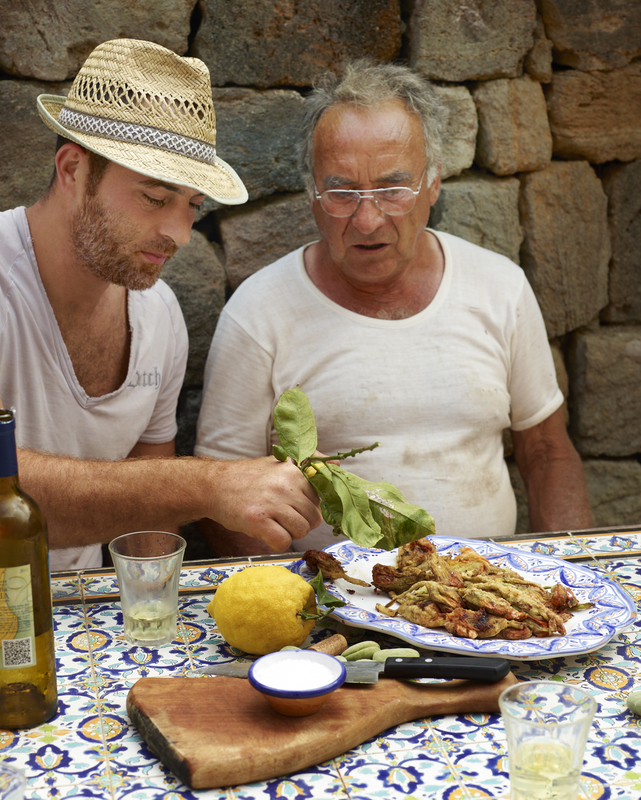 This entry was posted in Appetizer Recipes and tagged almonds, anchovies, annahuerta, lemon, oregano di Pantelleria, Pantelleria, Trapani Artisanal Intergrale salt, zucchini flowers on June 6, 2013 by Anna Huerta.